Water Creation's collection of premier single sink bathroom vanities will add a level of sophistication and class to any bathroom's decor. The crossroads of timeless design and innovative modern manufacturing processes merge harmoniously to ensure each vanity's finishes and function are as reliable as their unmistakable beauty. Constructed of 100% hardwood and not particle board, Water Creation prides itself on creating high-class vanities that are designed to last a lifetime. The marble countertop, ceramic sink, and elegantly crafted doors all lend credence to the durability and superior craftsmanship that Water Creation is known for. With the understanding that no one space is alike, all of Water Creation's vanity designs come in multiple lengths to accommodate any room size. Countertops are pre-drilled for a standard 8-inch widespread 3 hole faucet. Backsplash is included. Sink: Under-mount oval shaped ceramic sink included. If you want a vanity that is both stylish and useful, this modern vanity is perfect. This piece comes with a beautiful white fiberboard base and a white artificial stone counter. With a double-door cabinet and drawers, this vanity can hold all kinds of bathroom items. Put a nice twist on your bathroom project with this classic piece from Wyndham Collection. 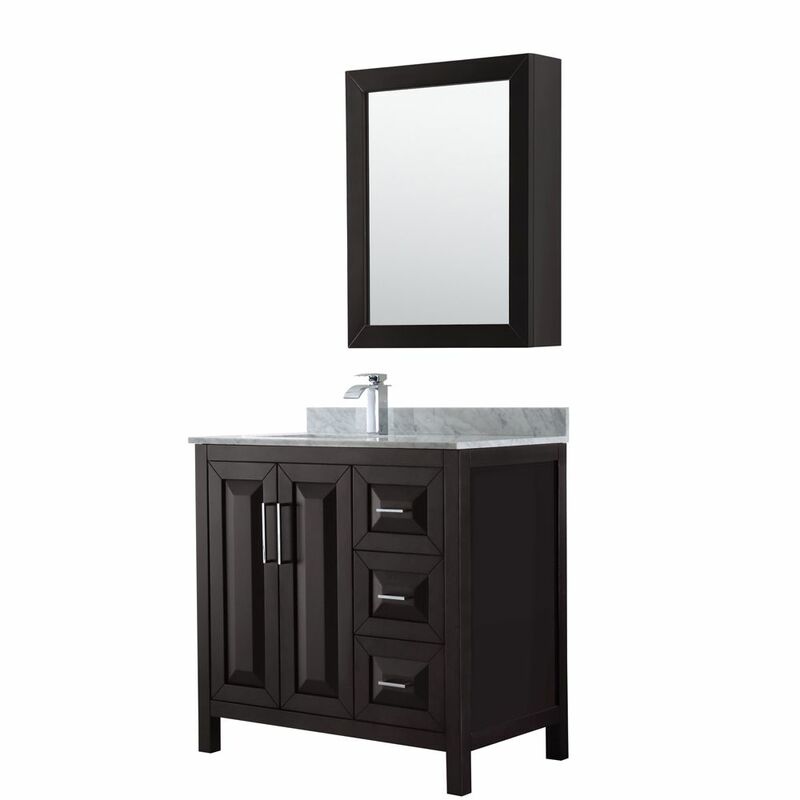 The Andover 48-inch vanity was built with both beauty and quality in mind. It was made of zero-emissions solid oak hardwood for reduced environmental impact, warping prevention and endurance. In addition, a 12-step hand-finishing process was used on the wood to ensure trouble-free and stunning looks, and durability. This white bathroom vanity cabinet has a marble top in Carrara white, white sink and white mirror all for a seamless look. The Andover 60-inch vanity with top was designed with an updated approach to traditional styling. It was crafted with an attention to detail, featuring strong, classic lines and decorative carved flourishes. The white vanity and Carrara white marble countertop are hand-carved and stained, and offer ample storage space. Daria 36 inch Single Vanity in Dark Espresso, White Carrara Marble Top, Square Sink, Medicine Cabinet The beautiful Daria collection vanities stand out in any bathroom with strong, clean lines, raised panels and elegant counters with square sinks. There's plenty of cabinet space, the fully extending drawers are dovetail construction, and chrome detailing completes the look. Daria vanities deftly combine the function of today with a nod to the elegance of the past. It's the new modern classic styling with a contemporary twist.